Voxmobile/Kevin Ryan photos: Ward Mahanke, courtesy K. Ryan. Voxmobile archive photos courtesy Brett Barris/Barris Kustom Industries. Man, those were the days! Free love, slick guitars, hot cars – and hey, you didn’t even have to worry about seatbelts, fuel consumption, or emissions standards. How cool is that? Okay, maybe we should have worried a little more about one or two things, but the gear looked good, anyway, and few pieces of pop culture were anywhere near as hip and groovy as the Voxmobile. This tricked-out custom hot rod was built in 1967 by George Barris, “King of the Kustomizers,” best known for his rolling works of art such as the Batmobile, the Munster Koach, the Monkey Mobile, the General Lee, and other custom cars seen on TV and in the movies in the ’60s and ’70s. With its blend of Brit-beat swing and hot rod shwang, however, the Voxmobile is bound to land atop any guitar fiend’s list of slickest street rods. Beneath its world’s-fastest-guitar exterior hides a bundle of surprises. If the Voxmobile looks a little familiar, there’s a good chance you once caught a glimpse of it in a former life, in one of its many TV appearances on shows such as “Groovy,” “Where the Action Is,” or “Dialing For Dollars,” or on the lobby card for the 1968 Jack Nicholson movie Psych-Out. But for the past couple of decades, rather than cruising the events and parades at which this promotional vehicle was intended to shine, or glistening in an automotive museum, the Voxmobile has been languishing largely out of the public eye. Thanks to the efforts of a pair of Denver ’60s-o-philes, however, who saved it from obscurity in cold storage, the plan is afoot to reintroduce this one-off wonder to society. Barris took this shot of the car with Jimmy Bryant. Another from this shoot was used on the cover of Bryant’s “Fastest Guitar in the Country” album. The Wing-Bat prototype atop the vehicle that inspired it. George Barris is continuing his association with instrument builders via collaboration with Hallmark Guitars, which is building guitars based on classic Barris models that appeared on TV and in the movies in the ’60s. 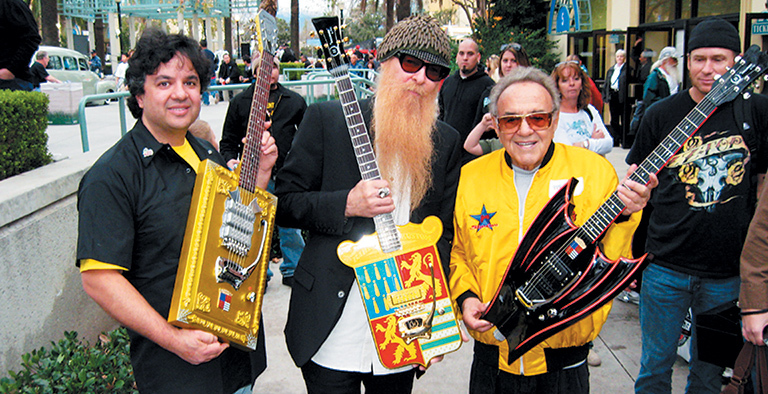 Bob Shade, Billy F Gibbons, and George Barris with prototypes of the Dragula, Barris Krest, and Wing-Bat models. The company is making the Wing-Bat model, inspired by the Barris’ Batmobile from the “Batman” TV series (replete with “turbine”), as well as the Barris Krest model, symbol of the builder’s creations. 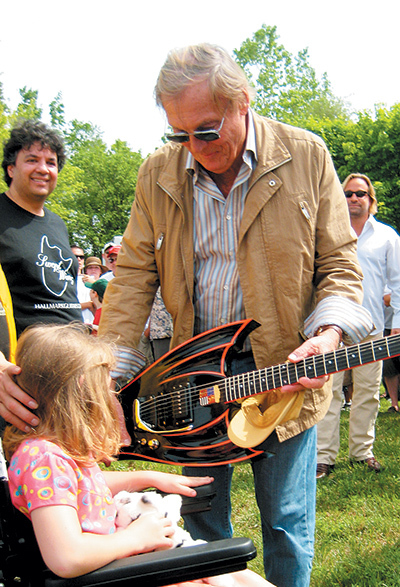 Adam West, who played Batman on the classic ’60s series, shows the Wing-Bat to a young fan. In line for the not-too-distant future are the Fireball 500 (a nod to a ’66 Plymouth Barracuda that appeared in the 1966 movie of that title and starring Frankie Avalon, Annette Funicello, and Fabian), and the Dragula guitar, which complements the Casket Car from The Munsters, with casket-style decorations. Down the road, the company plans to build instruments inspired by the Munster Koach, as well as other models inspired by classic movies and TV shows. Instruments will have custom-wound pickups, Shade’s needle-bearing vibrato, and a stay-in-tune roller bridge. Veterans from the classic TV shows that inspired some of the models have checked out the new Hallmarks. 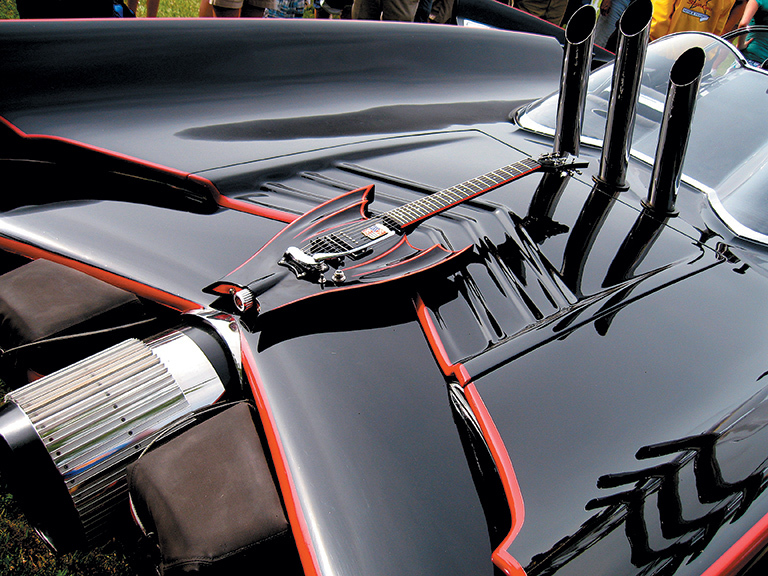 In ’08, Adam West (Batman), Julie Newmar (Catwoman), and Butch Patrick (Eddie Munster) appeared at Barris events, where the prototypes were displayed next to Barris’ creations, including Batmobile number seven. The celebs autographed the instruments, and one Hallmark/Barris instrument autographed by the TV stars and other performers raised $7,000 to benefit the Jesse’s Journey charity foundation. Notable musicians have also signed on to a recording effort (scheduled for release in the first quarter of ’09) that will feature Hallmark instruments. Participants include Larry Collins (who has ordered a twin-neck Fireball 500) Deke Dickerson, Eddie Angel, and the Ghastly Ones, among others. – Willie G. Moseley | Photos: John Lackey. Kevin Ryan is a guitarist, vintage dealer, and car fanatic who left the corporate world in 2002 to pursue the trading game full-time. And, having recently been tipped off to the availability of this rare prize, he couldn’t resist the temptation to bring all his stars into alignment in one rumbling, roaring bundle of love and – along with friend Brian Brock – to acquire the Voxmobile and restore it to its former glory. “Actually, the car was around Denver for many, many years,” says Ryan. “There used to be a music store called Strings and Things, on Colfax Avenue, and the owner had the car in there. I’d see it all the time in there. 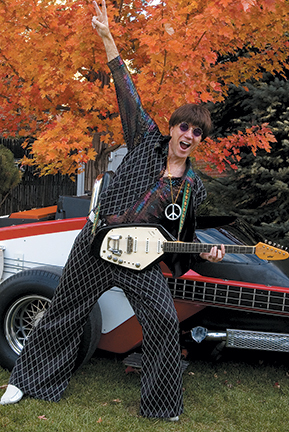 You’d see it, buy your strings, and walk away.” Ryan recalls the Voxmobile showing up in Denver in the early ’80s, but its transition from So-Cal custom street rod to Colorado guitar store novelty display follows a winding yet guitar-star-studded road. George Barris (middle) with Warren Hampton (far left), Vox’s national promo director, company president Joseph Benaron (second from right), and engineer Stan Cutler. The build cost $30,000 (“that’s close to $200,000 in today’s dollars,” Ryan points out), and Vox set about getting its money’s worth by dragging the car round to concerts, parades, and other functions in the late ’60s and early ’70s, as well as booking it for appearances on the big and small screens. “I’ve seen pictures of the Strawberry Alarm Clock standing on it,” says Ryan. 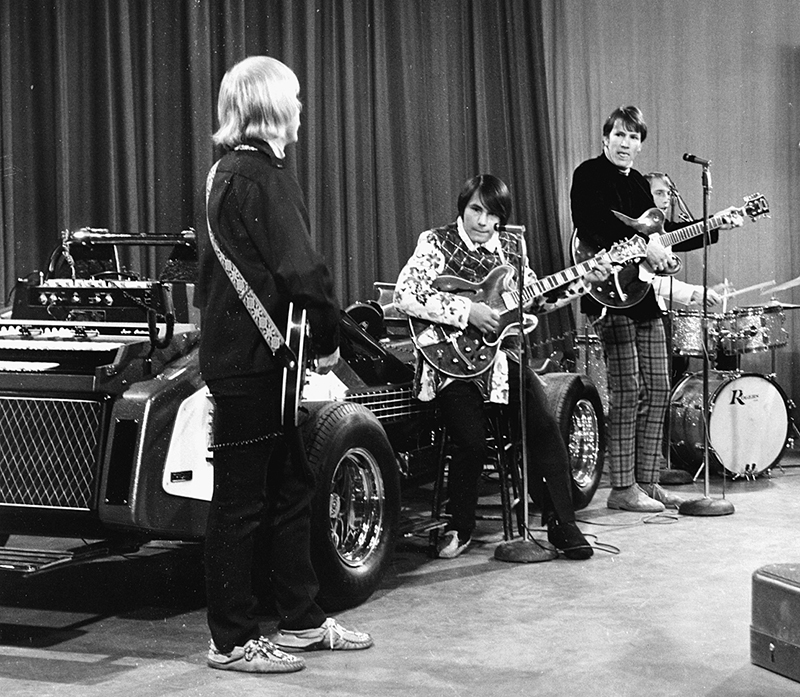 “They were appearing on ‘Groovy,’ and it looks like they’re plugged into the amps and playing.” It also appears on an episode of “The Beverly Hillbillies” in which Jethro befriends a band that uses it. Some years later, though, Vox apparently sold the vehicle to Denver music store Strings and Things, where it sat in dry dock for three and a half decades. After the death of the store’s owner, Ryan and Brock negotiated acquisition of the car, and its restoration is now underway. Promo photo for an episode of George Barris’ car show. The band is most likely members of the Strawberry Alarm Clock. 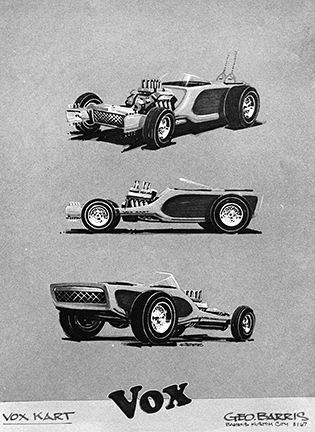 The first design concept and ideas presented to Vox by George Barris. As he obtained the instruments from Vox, Barris made design changes to accommodate them, and ultimately decided to make the body look more like a guitar, with actual strings. The large-scale replica Vox Phantom guitars on the sides of the roadster are perhaps its most notable visual feature, but a lot more genuine Vox product is literally hiding under the hood. “On the passenger side you’re looking right at the control panel of a Super Beatle amplifier,” says Ryan, “That’s the brain that handled everything. Behind the seat there’s a Super Beatle, and underneath that are the guts of two more Super Beatles. You plug into them via an array of 32 jacks mounted along the top edges of the display guitars on the sides.” Being products of 1967, these are the solidstate Super Beatles made for Vox in California by Thomas Organ, probably a good thing considering what that hot-rod suspension might do to all those tubes in four valve-based British Super Beatles! To belt it all out, there are five 12″ silver-frame Celestion G12 speakers secreted around the body of the car, one 18″ Celestion woofer, and four tweeters, not including the six speakers connected to the Muntz 8-track player mounted under the dash – handy for those moments when you don’t have a full band hanging on the built-in chrome running boards to keep the party in full swing. 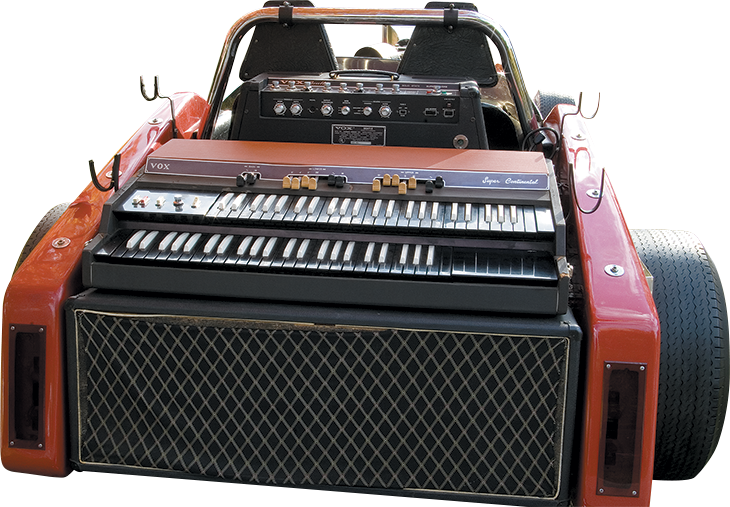 More than just the amps, though, there’s a full, two-tiered Vox Super Continental organ built into the back, and the Voxmobile originally had fully playable Phantom VI and Phantom IV bass guitars mounted at the sides of the tail section, though it appears they’ve flown off down the road many years ago. “I don’t remember ever seeing the guitars on there, other than in old photos,” says Ryan. “But I have my eye out for replacements. 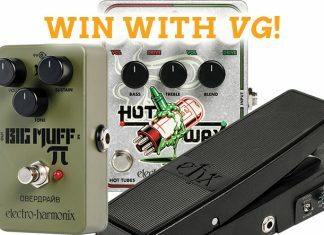 I did have a friend who is a Vox organ fanatic come over the other day, and I said, ‘We’re going to plug this in. What’s your best bet? Does it work?’ He gave it a 10 percent chance of working. But we plugged it in, switched it on, and it works perfectly – and sounds great!” The Super Beatle amps themselves will need a little more attention. Ryan says the wiring was reduced to a spaghetti junction of a mess after some previous owner tried to correct a short, but he has isolated all of the speakers and tested them, and they’re all working perfectly. The guitar jacks are all still wired and functional. 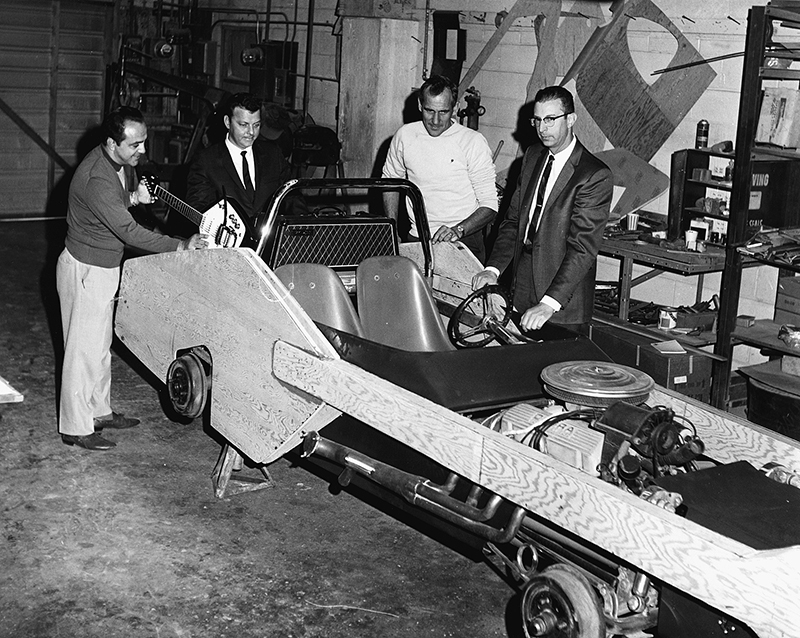 Barris (left) with Hampton, Les Tomkins (automotive engineer/Barris’ right-hand man), and Cutler at Barris’ shop in North Hollywood. 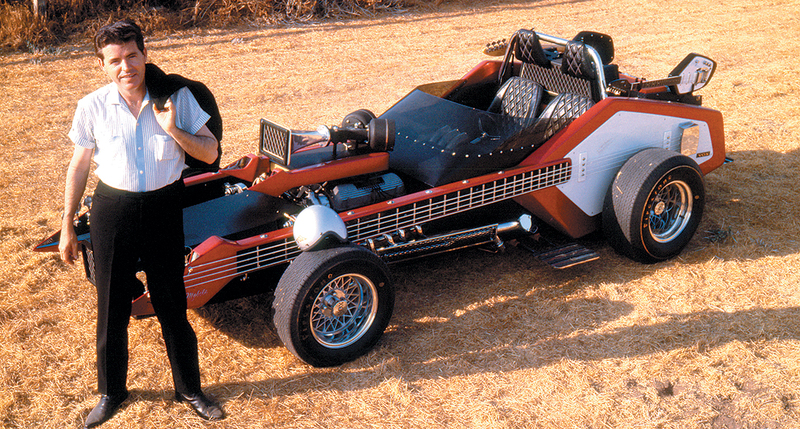 “The guitar shape was made out of wood, then coated in fiberglass and resin and finished with the same material as the rest of the car,” Barris recalled. And the car itself? Ohhh, the car… stand back, hot rod fans, because this unsafe-at-any-speed concoction of a roadster is almost back and ready to rumble. Given the full Cali-mod treatment by Barris back in ’68, it features a tubular chassis and a body formed of metal tubing and wood with a fiberglass skin. Appointments include pleated Masland Duran black vinyl interior, Muton fur carpeting (as Barris famously installed in a car he built for Sonny and Cher), Radar wheels, and 30 coats of metalflake Fire Red and White Pearl paint. The beating heart is a souped-up Ford Cobra 289 – the same engine used in the early AC Cobras… Entirely class A, of course, with no negative feedback! Kevin Ryan with the Voxmobile. “The specs said it could do 175 miles per hour,” Ryan relates. “But there’s no speedometer and no odometer. 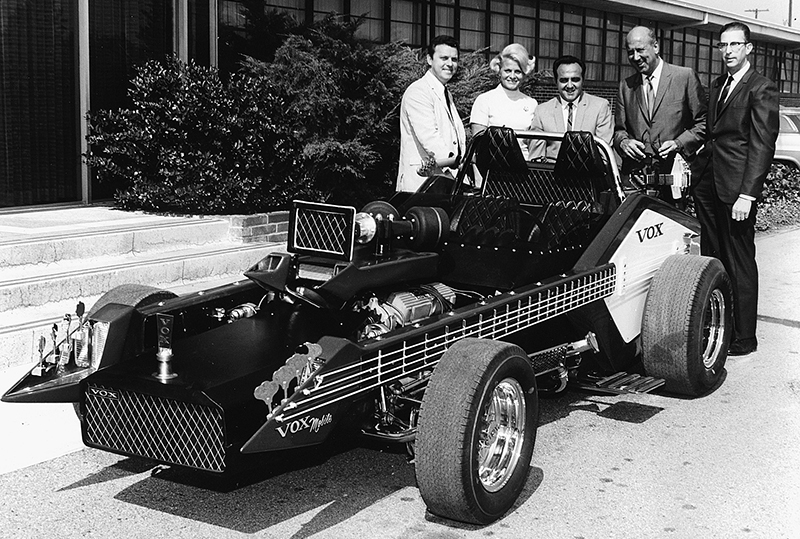 Since it was built for Vox, and Jimmy Bryant was then an endorsee and considered ‘the world’s fastest guitarist,’ Barris made it the world’s fastest guitar car. For more info on the car, both historic and current, go to voxmobile.com and barris.com. Special thanks to Deke Dickerson and Del Casher. This article originally appeared in VG April 2009 issue. All copyrights are by the author and Vintage Guitar magazine. Unauthorized replication or use is strictly prohibited.